The Case of the Embarrassing Shower -It’s all in the Construction!!! The Embarrassing Bathroom- Evidence piece number 1. A milky pinkish, beige color scheme with a greyish patterned granite vanity counter top. You heard well. Too many “ish” in a description to define color is a red flag. We used to live in a house with one bathroom for a family of four. I know we are blessed to have 2 1/2 now. The square footage in this bathroom is decent for an old New England home. I love that we have a window. And now, for the worse part: The shower was not constructed properly. This past year, the paint has started to peel.The clear door sweeps have started to yellow. Yes. I kid you not. So There. My Secret. Shared. I am sure you have a few embarrassing secrets of your own. Life happens. I resolved to solve this. I spoke with Shahab Shokouhi, a Writer at Dulles Glass and Mirror — a manufacturer of commercial and residential glass products including tempered glass, replacement glass, and shower doors. Contemporary Bathroom design by Candice Olson, photo: Toronto Photographer Brandon Barré. This is how a clean and seamless door system should look like. May I please have this bathroom???? When designing one’s shower door enclosure, Shahab explains there are several tips to follow to avoid leaks and mold. Following are four helpful tips that will keep the outside of your shower dry, and the installation of your shower enclosure, seamless. To minimize leakage, you never want your showerhead positioned facing the opening of the shower door. You want the showerhead to be facing the tiled walls or fixed panels. This will help keep the water inside the shower enclosure, and not on your bathroom floor. In the illustrations above, the first two examples are ideal. Avoid what is shown in the third example. When dealing with odd overhangs and raised tiles, one might wonder the best way to keep the water in one’s new shower. For one, to avoid gaps between the wall and the glass, use a fixed glass panel in your shower design and notch the tile so that the panel can be lined up flush against the wall. The maximum width and depth for notching raised tile is ¾” (depth) and ½” (width). To notch overhangs deeper than ¾” depth, you will need to consult a tile professional. Keep in mind that the enclosure may in some instances still require the use of a metal filler (pictured above right) between the glass and the buttress wall. To decrease the likelihood of leaks in your shower enclosure, make sure that the curb top you use is a solid piece of tile, marble, or granite. In the event that a shower curb is tiled with small horizontal tiles, the grout joints become an area where water collects and ultimately, mold and mildew forms. Having one solid piece for the curb top (without any grout lines) alleviates this potential problem. See the third picture above, to see the ideal curb top for your glass shower enclosure. Traditional Bathroom design by Vancouver Interior Designer The Sky is the Limit Design: Note the curb is made of one piece slab of marble. C’est très réussi!!! This tip is especially helpful if you’re installing a shower in a new section of your home, perhaps an unfinished basement. 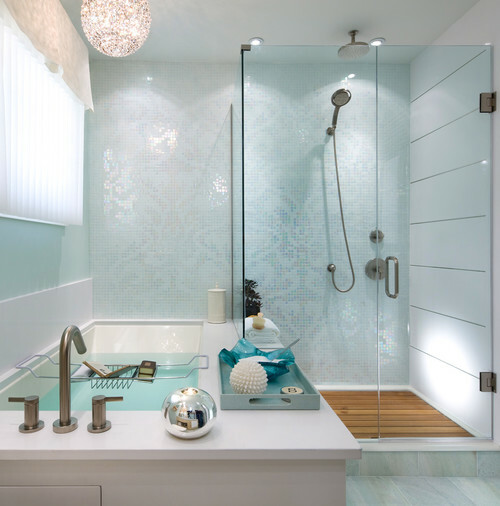 Be wary of any plumbing pipe and electrical wiring where you will be anchoring your shower enclosure. Anchoring screws may puncture anything behind the studs or walls. 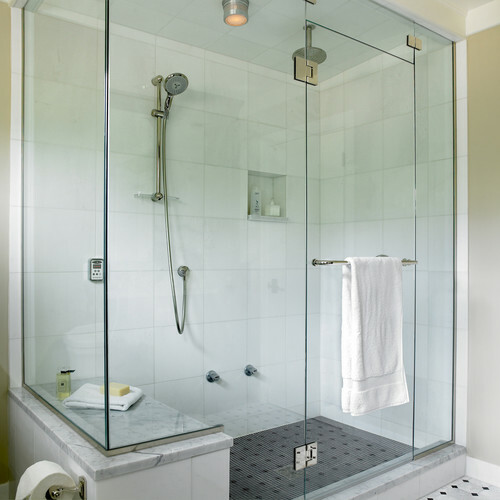 These tips will ensure your shower enclosure avoids leakage and mold, and is easy to clean and maintain. Not to mention, being diligent in your shower enclosure design, ensures that the installers run into zero problems come installation day. Thank you, Shahab, of Dulles Glass and Mirror , for assisting me in presenting construction tips on a seamless shower!!! 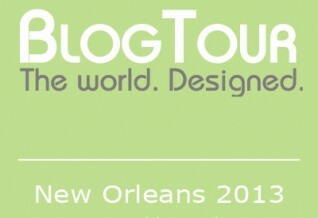 I will be busy re-designing my bathroom in the following year and I will make sure to follow these important pointers! Enjoy your day! A la prochaine!